Heat oven to 425°F. Spray large rimmed baking sheet with cooking spray. In large bowl, mix olive oil, salt and pepper flakes. Reserve 1 tablespoon oil mixture. Add potatoes and mushrooms to remaining oil mixture; toss to coat. Place potatoes and mushrooms on baking sheet. Bake 30 minutes. Stir, then make room on baking sheet for salmon. Meanwhile, in medium bowl, mix bread crumbs, melted butter, parsley and thyme. 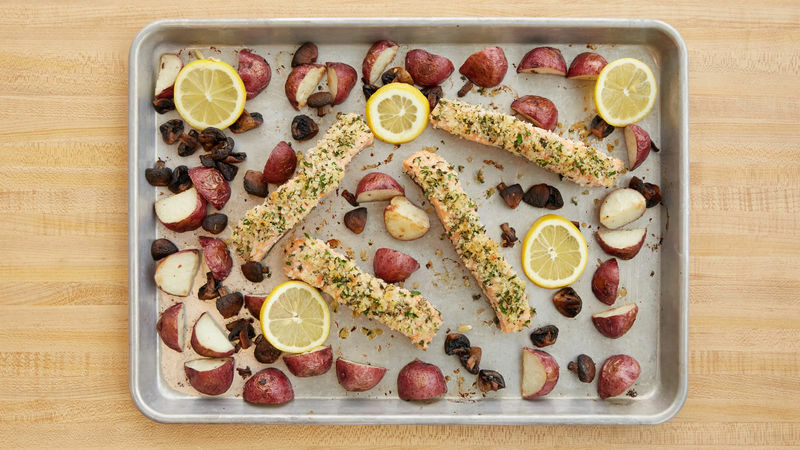 Add salmon to baking sheet with potatoes and mushrooms. Drizzle reserved tablespoon of oil mixture over salmon. Sprinkle bread crumb mixture over salmon. Bake 13 to 18 minutes or until salmon flakes easily with fork, potatoes and mushrooms are tender and bread crumb mixture is golden brown. Serve with lemon slices. Start potatoes skin side down for better browning and easy release when stirring. Feel like experimenting? Use cremini mushrooms in place of the white mushrooms for a little added earthiness.